One of those things I look forward to every year is when Starbucks bring out the red cups. It officially starts Christmas season for me. 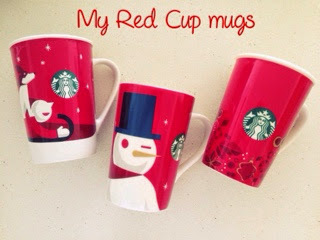 These red cups and my ultimate favorite Toffee Nut Latte set the Christmas mood for me. I honestly did not notice Starbucks changes the red cup design yearly. My attention to detail - a big BOO! I really thought it was the same red cup every year. Did you know that the red cups come in real ceramic mugs? My friend has the entire set although this photo only shows until 2012. So it came out as early as 2005. I decided two years ago I want to collect the 12oz mug not the entire set but only those I can easily get. And I only have three now. I bring them out during the red cup season and use them for my morning coffee. The 2011 was donated by this wonderful friend whose Starbucks collection is astounding (read her collection here). A year after I decided collecting, Starbucks decided to make my life challenging. The 12oz version was only sold in Germany. Good thing another friend from collecting sent me last year's red cup. For this year, it will again be sold in Europe and I heard the US. Darn. Do you agree that the red cups set the Christmas mood? In a month my family had two birthdays and a dedication. This family loves the BER months. We celebrate birthdays and anniversary from September to January. It was a tough time for our family as Jed undergoes treatment. But the boys' birthdays would go on so we celebrated it the simplest way we can. 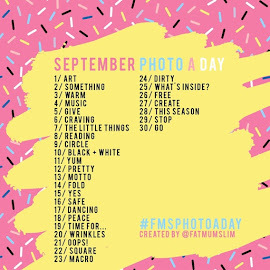 Our baby is now one. Wow. My mother and siblings flew in the weekend of Caleb's birthday. We had to forego a birthday party and instead went ahead with his dedication and a small party with only our family members. 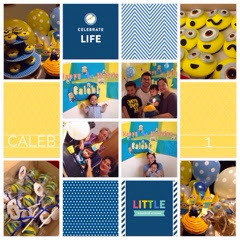 Caleb's ninang (godmother), my sister, together with my sister-in-law, brought in decorations, cupcakes and cake pops from Manila. My sister also conceptualized the Minion theme. I am forever grateful she made sure the little one had his own special party. She lifted that load off me. Caleb even had both his grandmothers - maternal and paternal - with him as he turned one. 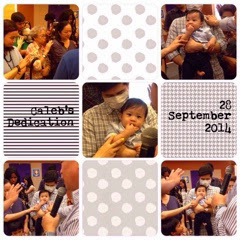 Our church prepared a special dedication for baby Caleb. It was touching having all these people pray over him and speak blessings over his life. We can really count on our spiritual family to make it memorable for us. My first born is now 5 years old. Time is flying so fast for my babies. He is more aware and had wanted his own birthday party. Well, he had a short celebration in school with his classmates. The big party would have to wait until his dad gets better. 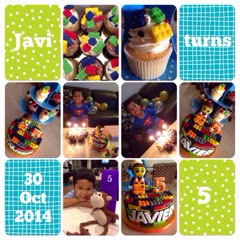 Javi's preferred birthday theme kept on changing. One day, he wanted Spider-Man, and then The Lego Movie, and when I finally ordered his cake, he wanted Iron Man. I had a cake and cupcakes made with The Lego Movie theme. And he loved it. I found this gem of a baker in Sukhumvit 49. I wish our situation made it easier to celebrate the boys' birthdays. Thank you Lord for letting me think of little ways which made the boys feel extra special on their special days. And thank you for blessing Jed and me with two happy boys who are our source of joy right now. May we have many more years to celebrate birthdays with our sons.